Everything here works beautifully (...). The orchestral partnership is beautifully honed. Gerald Finley's debut-album on Ondine is devoted to the music of Dmitri Shostakovich (1906-1975). It includes the premiere recording of the orchestral version of Scottish Ballad ‘Annie Laurie'. Six Romances on Verses by English Poets is recorded for the first time sung in English, with the original full orchestra version from 1943. Initially maestro Sanderling and Ondine were made to believe that this would be the world premiere recording of this orchestration, but it has come to light that Gennadi Rozhdetsvensky made a recording of the work in Russia in 1986. We regret the misinformation in the booklet of the first edition of the CD, it will be corrected in the second edition. Also included is a premiere recording of a very late Shostakovich masterpiece: the orchestral version of Suite on Poems by Michelangelo - sung for the first time in the original Italian. The work, composed in 1975, was one of the last pieces completed by Shostakovich. Grammy-award winning Canadian baritone Gerald Finley has become one of the leading singers and dramatic interpreters of his generation, with award-winning performances and recordings on CD and DVD with major labels and performing at the world's major opera and concert venues in a wide variety of repertoire. On this recording the Helsinki Philharmonic Orchestra is conducted by Thomas Sanderling, friend of the composer and a Shostakovich expert who has conducted award-winning Shostakovich premiere recordings. Sanderling was also personally involved in the process of the discovery of the versions included in this recording and conducted their premiere performances in connection to this recording. 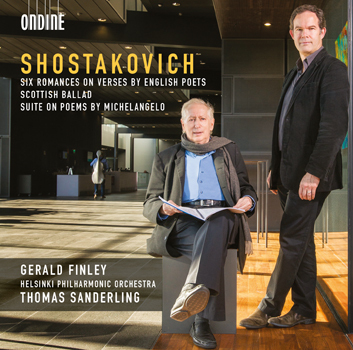 The booklet features an essay by Gerald Finley about singing the Michelangelo sonnets in Italian.